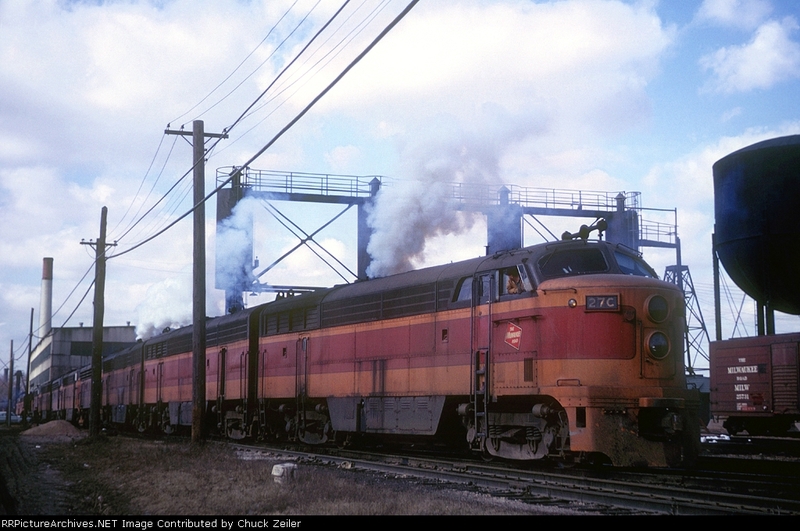 MILW CFA16-4 27C at Bensenville, Illinois on February 14, 1965, Kodachrome by Chuck Zeiler. Built in August 1951 (c/n 16L488), class 16-FF on the Milwaukee Road. It is seen smoking at the Milwaukee Road's Bensenville engine facility. According to Jim Boyd's book, "Fairbanks-Morse Locomotives In Color" (ISBN 1-878887-63-7), there are two possible explanations for the smoke. Unlike Alcos, which produced black smoke as a result of turbo-lag, the F-M's opposed piston (OP) diesels were normally aspired, using a Roots blower to pressurize the intake air. "While a properly maintained OP is a smooth and reliable engine, they tend to develop one distinctive characteristic: blue smoke on acceleration. This is the result of two potential causes, which are usually mixed to varying degrees. The first is lubricating oil. While the bottom crankshaft lives in an oil-filled crankcase (like an EMD), the top crankshaft is in a "dry sump", lubricated by pressurized internal passages and a surrounding spray of oil (like the top deck valve chamber of an EMD 567). When the OP idles or shuts down, some of the top sump lube oil will drip down the cylinder walls above the piston, and if the walls are scored or the piston rings are worn, the lube oil will get into the firing chamber and often pass unburned into the exhaust manifold, where it can ignite in a smoky pall when the engine is revved up. The other cause of smoke is the cooling water seeping into the cylinders from the seals where the injectors pass through the water jackets around the cylinder walls. This will also cause smoke. You could tell how well an OP is being maintained by its penchant for smoke upon acceleration."